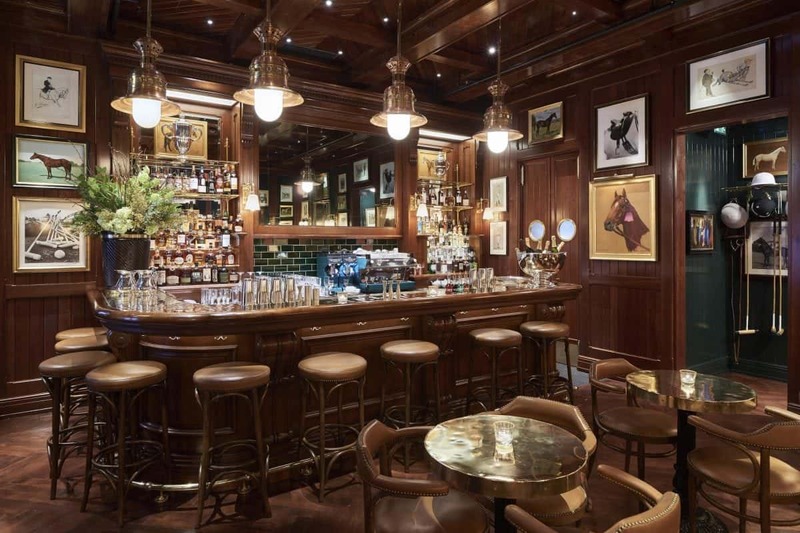 Following suit with designers such as Burberry, Hackett and watchmakers Larsson & Jennings, Ralph Lauren have opened a new food and drink-based venue within their flagship store on Regent Street. Ralph’s Coffee & Bar joins the likes of The Polo Club in New York, RL Restaurant in Chicago and Ralph’s in Paris, and thus marks the brand’s first space dedicated to food and drink in the UK. The intimate space has table seating enough for 24, plus 12 stools at the bar. The equestrian-themed décor with abundant polo references is perhaps a little audacious, with its brass-topped bar, saddle leather blanquettes and a palette of browns and bottle green – but what else did you expect from Ralph Lauren? Throughout the day, a number of small sharing plates are offered (think oysters, tuna tartare open sandwiches, etc. ), as well as Ralph’s Coffee – a tremendously popular custom blend that’s roasted specifically for Ralph Lauren. The main draw, nonetheless, is the cocktail list which includes a number of classics alongside some new fangled creations. There’s also an impressive repertoire of spirits, including a particularly strong selection of tequilas and American whiskeys – naturally. To begin, breaded and deep-fried plump green olives are undoubtedly the only bar snack I’ve ever tasted which are worth mentioning, without serving as a perfunctory, heavily-salted accompaniment to make us drink more. As for the cocktails, ‘The Ridgway Margarita’ is very much a classic Margarita, yet uses Tapatio Blanco tequila – a premium spirit that’s a far-cry from the tequilas that taste as though fit to clean toilets, stirring unwelcome memories of teenage intemperance. What’s more, this particular tequila has a prominent spiciness with notes of red pepper, working surprisingly well alongside the lime. The ‘Smoking Jacket’, on the other hand, combines Monkey Shoulder malt blend and Connemara single malt whiskies with lemon and ginger-honey syrup. Instead of bringing undesirable sweetness, the syrup tastes of ginger far more than sugar and complements the whisky. Another whisky drink, ‘The Chairman’, uses Whistle Pig rye and has an absinthe rinse (both classic Sazerac components) as well as cognac-infused Cointreau noir and pomegranate with a dash of maple syrup to counteract any overpowering sourness of orange or pomegranate. This is a particularly well-balanced cocktail that demonstrates an impressive level of skill. Elsewhere, ‘Regent Street Sour’ also uses Cointreau and pomegranate, but has a gin base with plenty of lemon and a frothy egg white ‘head’, as is classic with a traditional sour. Another classic, the ‘Old Fashioned’ at Ralph’s does not try to be innovative. The drink sticks to the simple, classic recipe and is all the better for it. Eagle Rare bourbon from Buffalo Trace distillery is used here, featuring a woodiness that’s matched perfectly with oil from the orange rind garnish, sated with a cube of Demerara sugar and a tiny dash of angostura bitters. Although the bar closes each night at 8pm (6pm on Sundays), Ralph’s Coffee & Bar is ideal for an after-work drink, or as a refreshing pit stop during chaotic shopping expeditions along Regent Street. Ralph’s Coffee & Bar can be found at 173 Regent Street, London, W1B 4JQ.